Today’s show definitely is going to be in the podcast’s lifestyle category. 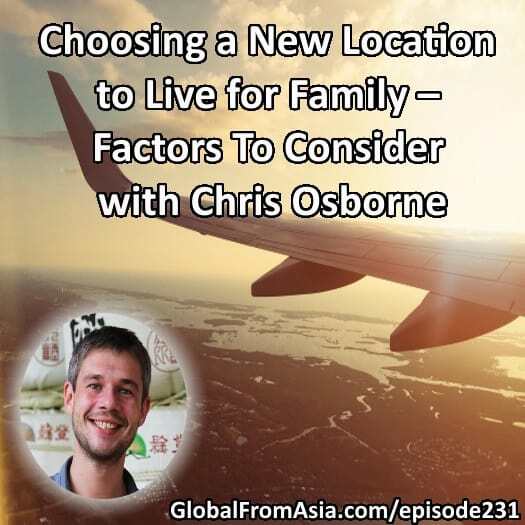 Chris Osborne is an amazing entrepreneur and he and I are both adjusting to “digital nomad family” lifestyle. Seems a growing trend from his and my email and social media inboxes. More people are moving from single and “couch surfing” in Southeast Asia and moving towards a more stable and permanent family lifestyle. In today’s show we each picked a list of points we used in our criteria of what we were looking for in our next big move – for children and education, for the spouse, for ourselves as business owners. I also added a blog post of my 4 country trip in text form after the show notes on this blog post. A place to go out and walk more. Easy to get to airport , to other major hubs I do business in. Can also have friends and things to do. Not blocked, not slow. Infrastructure in general…. Thank you Chris for coming on the show! A bit of a different topic than our normal business discussions, hope listeners enjoyed that. Also we tried a bit of a different free flow style format – and I didn’t even know his 7 main decision making factors either. One funny thing Chris said to me after the show was – neither of us had business on that list. Think it is an adjustment in values as we become husbands and fathers. Priorities and time allocation re-adjustment. And a bunch of my friends are certain I will get lazier in Thailand – we will see about that. Step by step, and day by day, we should be improving ourselves, and I will continue that mantra whether it is in Thailand or another country. Location shouldn’t matter so much in today’s day and age – but unfortunately it does. For those following along in our video blog here at Mike’s Blog you will see quite a bit of action on discussing which school to send my kids. Wendy (my wife) and I have been feeling the pressure on making a move out of China as the kids get older and older. With so many questions from friends and readers, and my passion for blogging and sharing knowledge – we put together this guide that shares the various places we considered and the pros and cons. So, I have been in China since 2007 (writing this in 2018) and it has been quite the adventure. This very blog started when I left my Wall Street job to go full time e-commerce and sourcing – which lead me to permanently relocating to China. This country has seen massive growth and I have been here for a wild ride. As it has had massive growth, it has also had massive cost of living increase. Can’t help but regret not buying property when first moving to China in 2007! * Tons of Business Opportunity – if you are looking for business opportunities, China will never seem to run dry. It is the place to be for entrepreneurs who have an idea and want to make something happen. Shenzhen, my home for 10+ years, is the capital of hardware electronics, so if that is your forte, then you need to be here. * Learn Mandarin Chinese – one for me for sure was to make sure my kids learn Chinese at an early age. I am still struggling to learn Chinese and if I had learned it at their age I would be miles ahead. Think anyone reading this would be hard pressed to convince me that Chinese language won’t be important in our kid’s generation, knowing mandarin will be critical in the coming 100 years. * Immigration – I’m already “immigrated” to China, have a company established here and work permit, so no new headaches. Although I do wish I could get a longer term visa or something more formal instead of yearly renewal. * International Exposure – There are people from around the world living in China, and the kids get to meet so many of them. * Costs of Living and Education – When I moved to China in 2007 it was a huge fraction of what it is now. I never thought I’d live here until I had kids and sent them to school – so I think to be fair it wasn’t factor upon moving here. School for expats has always been very expensive in China – as Chinese have a huge priority to the best education for their kids, at any cost. * Food and Air quality – I know, I don’t want to pick on this one too much. But literally yesterday (July 25 2018) my wife told me about another scandal of fake vaccines in China. I’m sure it will be covered up by the government as fake news or something, but seriously there is always a problem with food or health. * Less relevant for my business now – I have been working hard at Global From Asia discuss more on Crypto and blockchain and with the government restrictions it just makes me more and more nervous to live here for me and my family. I have had a bunch of contacts in China reach out to me to try to convince me to reconsider and stay in China. But I would say it is a tough one to crack for me as the pros and cons above – it is a math formula, and I can find other places where my kids can still learn mandarin. Moving back home is a common option and choice for many foreigners in China, heck, in any country, once they have kids. There are a lot of benefits for a citizen to live in their home country and receive the benefits a government provides its citizens – especially as a parent. * Free public education – my kids are US passport holders and would be able to enroll in a public school where we would end up moving. Sure, the quality and caliber of the school depends in which city and which district we choose, that is the case for any public school system globally, right? * Business opportunities as a “China expert” – A few friends have said I could make a lot of money training people about China business in America. Or other types of learning and education from my Global From Asia blog network and experience. * Easier Lifestyle – I think it goes without saying, as an American living in America, the headaches of visa, banking, business, and life in general would be much easier (although would need to look into things for my wife with a Chinese passport). * Avoid Double Taxation – as an American living overseas, the US government requires you to still pay taxes in America. Yes there are exemptions, but there are less and less now. * Increased Cost of Living – This is up for grabs. Sure I could get free public education for my kids – but that is based on what kind of public school – I remember living in USA and the school district is based on the neighborhood you live in. Briefly browsing real estate – many times the cost of a home is based on the school district. * Increased Medical, Tax, Insurance Fees – I would avoid double taxation (see pro above) but I would also start to pick up new kinds of fees and taxes. Medical insurance is crazy expensive in America – and as an entrepreneur I would have to get my own policy. I have to admit I am not too caught up on this but when I was last living there and full time entrepreneur in 2007 I only saw an option called COBRA for like 500usd a month for very very basic medical coverage. * Less business relevant, Less “adventure” – I have to be selfish here – this is more for me and less for my kids – but I am “addicted” to doing business in Asia. Yes it is a struggle compared to US domestic business – but I have a passion for it – and I built my business, GlobalFromAsia.com based around growing an empire from Asia. I don’t think I would be happy and challenged living in America, and I feel this would always bother me and affect my overall “happiness index” and ultimately affect me as a father, husband, and human being. So while moving back to America / to your home country is a common one for many friends living in China that want to settle down, it is not one for me. I am addicted to the complex and “difficult” Asia business, call me a sucker for punishment. Immigration – Straight forward immigration – I am often in Hong Kong and the business blog Global From Asia started out as a podcast for HK business incorporation. I’m a partner in Unipro, a CPA firm, that is growing and has local staff. I could apply for residency pretty straight forward. Trilingual- Mandarin, Cantonese, English – it is a place with a lot of languages, with even more international people here. Business opportunities – Hong Kong is a financial hub, and tons of global headquarters here. As I get more and more into Crypto, this is a hot spot to be. Huge cost – It has always kept me out of HK over the years. And when you have kids – the cost is insane. Sure, I could look into getting a Hong Kong ID and then the public education system, but friends here, local HK friends, still send their kids to private schools. Not much Mainland China exposure – While it is right next to Mainland China, the systems – the “connectedness” between this special administrative zone and Mainland China is still definitely separate. I have spent a lot of time in the Philippines since 2009 ! Plus a huge amount of Global From Asia’s team is based there, and there is English everywhere. * Costs of living – very reasonable costs for rent and life in general. * A lot of Chinese – although I almost want to cross this out as I think almost all the options today will have that (Asia is more and more dominated by China business influence) – there are definitely a lot of Chinese language options for the kids. * Different school calendar- one thing that really set us back was the school year is totally different from most other countries. I was with Joko from GFA and a nice Catholic school in Cebu seemed perfect – had Chinese and English classes, etc. But the calendar was so different we would have waited until Jan/Feb to get on the start of a new school year. They did say the international schools do have options that are closer to the international school calendar, I didn’t dig deep enough. * International schools prices are not that much lower – when I did look at international school costs, the fees were not much less than what I am paying in China already. * Traffic – seems to be such an issue we would need to live in an area that is walking distance to school (well we want that anyway) – but for example in Manila – basically you need to skip traveling at rush hour – as a 20 minute ride will take 2 hours instead (for example). Now, I have picked Thailand as of writing this – so I will try to not be biased and just lay it out for your own research. *Costs of Living – both in life as well as education. I think it has come up over the years, but still very reasonable. * So many international schools to choose from – it was overwhelming, Wendy and I really had too many choices, and the prices were in all sorts of ranges from low to high. * Easy lifestyle / low traffic – I’m more talking about Chiang Mai, but I would think even Bangkok has less traffic than most of the other countries we are looking at. Plus the food quality, pollution seems much better than most other places. * Less business opportunities – this is a “digital nomad” hub for a reason – there isn’t much domestic business opportunities that I can see. * Less Chinese – but there is quite a bit of China influence, and many schools have at least some Chinese language in the school. * More “amateur/ newbie” business community – I don’t want to offend anyone – and heck – I picked this place regardless, but Chiang Mai is known to be more newbie business level. * Immigration – we are going through it now as a guardian (parent) visa. Hope it goes smooth, but it something to note. So we didn’t visit schools in Malaysia – but still continued our trip. I met with Rebecca, a friend of Kim from Park Lu – and had coffee. She had also moved out of Hong Kong / China scene earlier this year and was explaining there are plenty of schools in KL that have Chinese as well. Also met Henry and Rachel, who had been living there for a few years now with their children (a bit older than Miles and Maggie). They also said it is much cheaper and higher quality than choices they had seen in China while living there. The government seems to also be improving with a new prime minister in place the hope is this will reduce corruption and improve the economy. The Grab taxi drivers also were explaining more and more business is coming to KL – from Singapore and other parts of Asia. There is a lot of languages with English, Cantonese, Mandarin and more. Very “exotic” for sure. This could be a good place – I met some corporate setup agencies there too and the business setup seems straightforward. So many languages – definitely get a lot of exposure. Centrally located – KL is a major airport hub – we had to connect here so many times for many of our flights. School choices – well – to be fair I didn’t dig too deep and friends did mention there were a few options for Chinese and English language schools. Networking – didn’t notice much of a business scene, but I was there only a few days. I did get to go to a Payoneer VIP dinner and met a few Amazon FBA sellers doing really well. Our last leg of the trip – we went to Kathmandu and also some other smaller towns in the area. This was really more for Wendy’s own Buddhism journey and experience. Definitely the lowest costs. I read a book about living here, and they said electricity blows out often – but I didn’t notice that too much. My 4G Sim card has been fast and steady connectivity. To be fair, this is only after a few days so I’m sure living here you would notice more infrastructure issues. Super cheap- by far lowest cost place we have been to. English everywhere – everyone seems to speak English. I am told that it is because in order to study or learn anything you need to speak or at least read English – as there aren’t many books in Nepalese language. Not centrally located – this place is a few hours flight to KL, and then a flight to anywhere else. Would be hard for me to do much business networking. Not much of a online business owner community – seems this is not on the radar of many internet business owners – although I do feel the internet is nice and the costs are super low. Not much Chinese – our kids wouldn’t get Chinese exposure – sure there are tourists – but don’t believe schools have it (to be fair we didn’t research too many schools here). Still developing infrastructure (roads!) maybe the internet is nice – but the roads – most are still like off-roading in a 4×4. Dirt roads and massive gaps in the road at some points I thought the SUV were in at times would get stuck in the mud and I’d need to get out and push! Maybe I should have considered this one more – maybe I just feel it is a bit less commonly talked about / not as top of mind as other southeast Asia countries I have been considering? I’ve been down to Saigon a couple times in the past year and it has been growing like crazy! Also some really good friends there. * Huge business opportunity – seems like things are booming there. * More experienced business community – Seems from my personal network a lot more experienced entrepreneurs are there. * Easier Visa policy – a lot of friends have told me immigration is easier here than in Thailand. I don’t have facts to back it up, but this is my research. * Less international school choices – I think because there are less teachers moving there? Thailand is more attractive for teachers? My biggest response to my many friends and contacts talking to me about moving to Vietnam was that I am not finding and overwhelming amount of international schools at reasonable prices. Sure, there are international schools, but the prices were more like China and less choices. Maybe I am missing some options, but this blog again is my field notes to help others. I’d love to hear more. Those are the ones I have on the list. Again, this is a field notes, my brainstorming written out on paper. I would love to hear your own insights. And I don’t want to offend anyone. Sure, we are all “from somewhere” and I may offend my American hometown friends because I don’t want to move back. Many are happy where they are – but many just simply accept where they are born as where they need to live and raise their children. I am not accepting that. And I wish more people would open their minds. I agree, it is not easy to live outside of your home country. And many may not have the financial chance to. Heck, I am pushing the limits on there and have a lot of people to appreciate for the opportunity. I’d love to hear from you! Let’s make this blog post a place to share and learn. As a new parent in Asia – an American in China – well now an American entrepreneur in Asia (less broaden a bit) – it is stressful. Maybe my blog, Mike’s blog – will turn more and more into a parent’s blog. So be it, it is an interesting and needed topic. Being a parent is a challenge, and being a parent outside of your home country, outside of your home element, is even harder! Kudos to all the parents out there, especially those living away from home. I wish one day we didn’t have these borders. All this immigration stuff, is it really needed in today’s global world?